Picking up yoga again was one of the best things I did for myself. Pre-kids, doing yoga was very much about losing weight, and getting in shape. Now, I realize, yoga is never about getting the body we desire. That is the by-product. It is essentially about getting a balance in life, and using the time we do yoga to be connected with our inner self. Sounds complicated? I used to think that way too. But really, when you practice yoga over a period of time, you will learn of how it can benefit not only your health, but also your general well being. I know there's been some articles floating around about the religious views around yoga etc. I don't have strong religious connections, and hence will not be going into any such discussions. 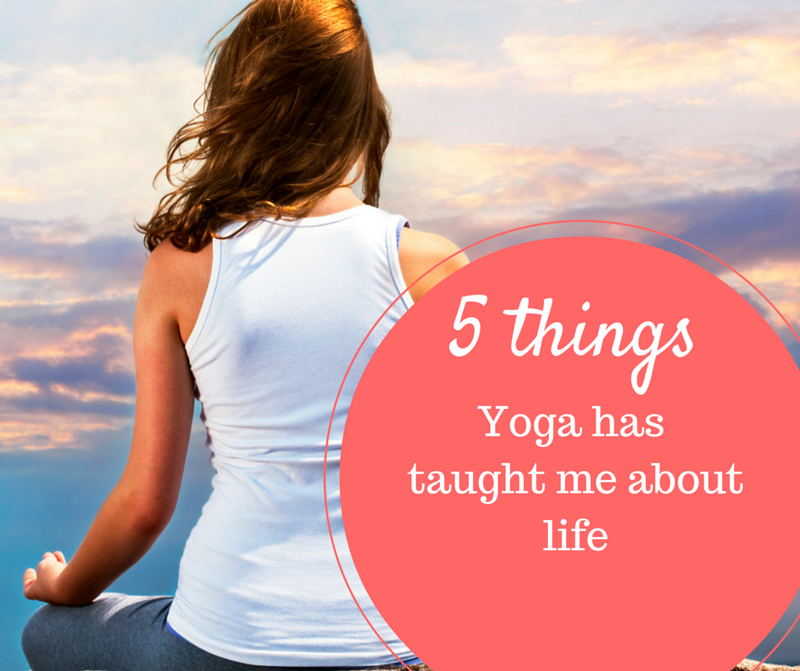 This post is purely about how yoga has benefited me and made me live my life better. Starting yoga, doing the poses and holding them requires a huge amount of concentration. Not everyone starts out knowing how to do them, but we improve along the way. The key to seeing improvement in one's practice is to always be present during the session. My favourite yoga instructor always starts his sessions by telling us to cast whatever's on our minds and focus on the practice so we can make it a good one. Those who have tried yoga before will also realise how we are always asked to focus on a point while trying a new pose. Very often, one will notice, the more we put our mind to it, we are able to bend further, reach higher and balance better. Such can be applied to daily life too. Yoga is essentially about learning to breathe correctly. In through the nose and out the same way again. Breathing brings oxygen to the blood which then gives us more energy which in turn helps us to feel less stressed. Go ahead! Try it. When things are getting a little too much to handle, take a deep breath. I am sure you will feel better instantly. And, you perhaps think more clearly! I have learnt to let go of my inhibitions of doing some poses, of the fear of judgement for not being able to do the poses correctly. More importantly, at the start of each practice, letting go of what is bothering us is essential to fully benefit from it. No matter how urgent or pressing the matter is, the fact that I can afford that 60 minutes in the studio, means it can wait. So letting go of these little worries in life helps manage our stress levels. I practice over lunch which works perfectly for me especially on a rough day. It is like pressing the pause button momentarily. No one walk into a yoga practice for the first time knowing how to do every single pose. This applies for every other sport for that matter. While we are not expected to do perfect poses but do what we can manage at that time, practice does make perfect. We are often reminded, no matter how tough the practice is, never give up. We can take breaks and go into child's pose. But never ever harbour the thought of walking out. Very much like like life's lessons isn't it? Of all these, the biggest benefit I saw from my practice is a calmer me. Just what I need to face challenges at work and of course the endless chores at home? Have you tried yoga before? Do share how it has helped you in you daily life. Love to hear from you.